Atherton Painting & Renovations offers home painting, remodeling, and construction services from Albany to the Lake George region. Frustrated by the lack of results from his existing website and eager to take his business to the next level, James Atherton contacted Mannix Marketing with the goal of building an online presence that would position his home painting and renovations company as a leader in Saratoga Springs, Glens Falls, and the surrounding markets. Phase one of this program entailed a website redesign, where our design and development team created a professional, mobile-friendly responsive home renovation website featuring photos and information explaining Atherton’s kitchen and bathroom renovation, painting, and home remodeling services. Next, we began growing his visibility online and attracting more prospective customers to the website through social media marketing, pay-per-click (paid search), and Search Engine Optimization strategies. 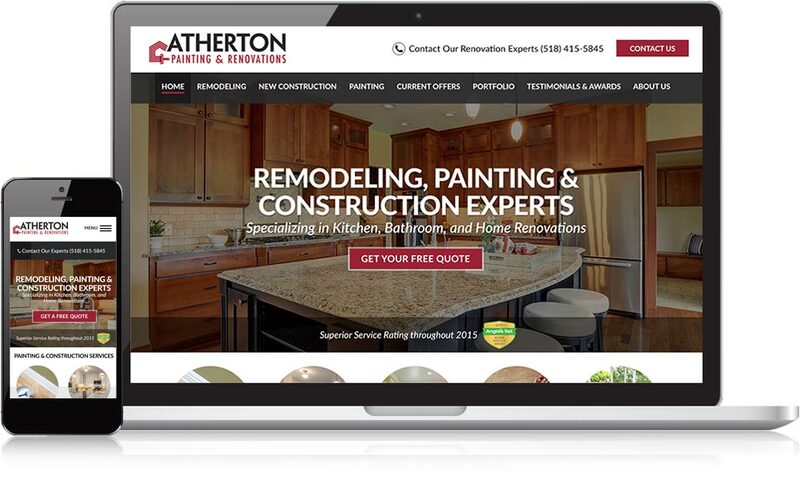 Over the course of this program, our team promoted quality content on Atherton Painting & Renovations’ social media accounts and helped the company experience strong results from social media marketing. Amberly went above and beyond, exceeding ALL expectations. She brought me massive results by promoting my business on Facebook, even though she had little background in the construction industry. She can execute on what matters!